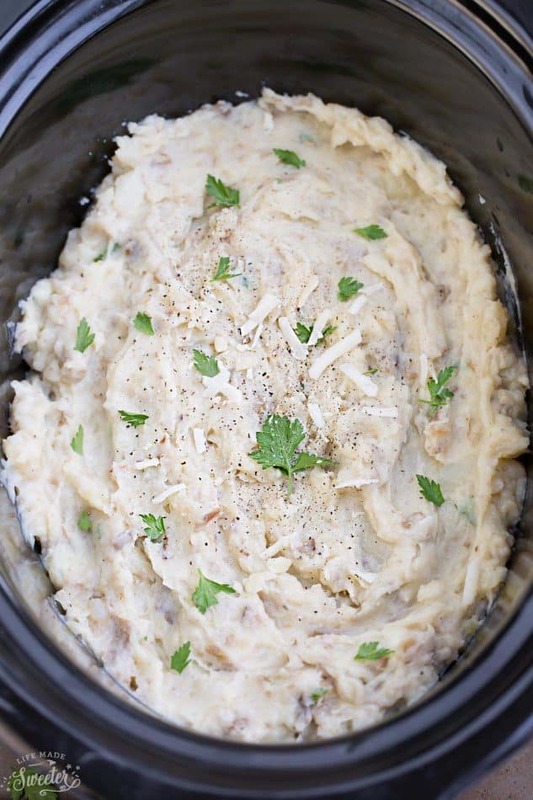 Slow Cooker Mashed Potatoes with Roasted Garlic - BEST east recipe! 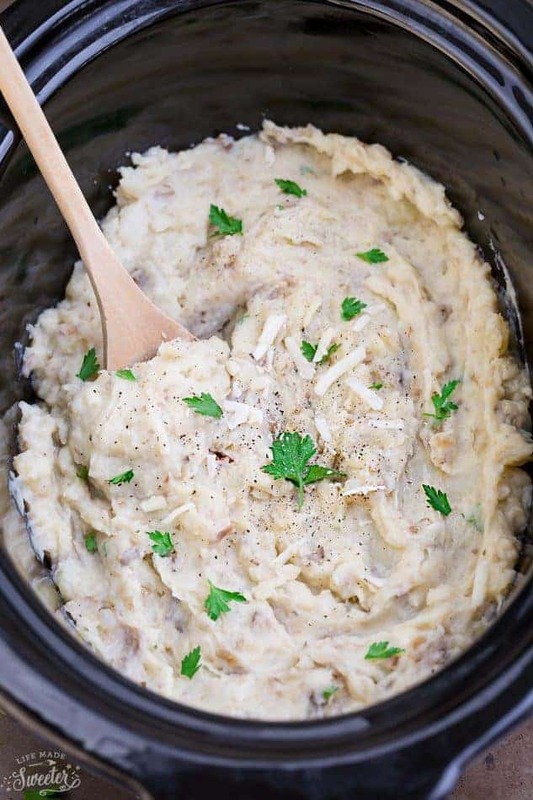 Slow Cooker Mashed Potatoes with Roasted Garlic are the perfect easy side dish. Super creamy, buttery and super simple to make right in the slow cooker! Best of all, there’s no preboiling required! Side dishes are my absolute favorite. I can happily load up my plate with just roasted vegetables, glazed carrots and mashed potatoes. 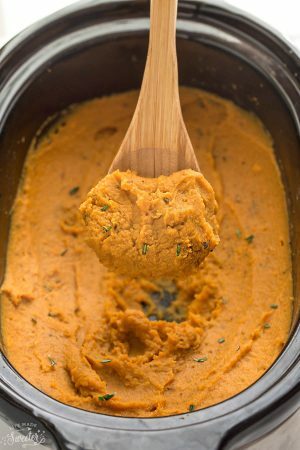 The slow cooker helps to make things easier during the holidays when you’re planning that big Thanksgiving or Christmas feast. 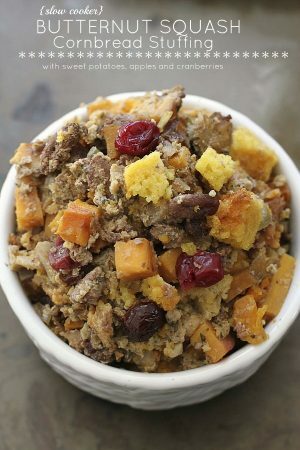 This Slow Cooker Butternut Squash Cornbread and stuffing are among our favorites. Just toss everything into the pot and in a few hours, your dish is ready without any babysitting. 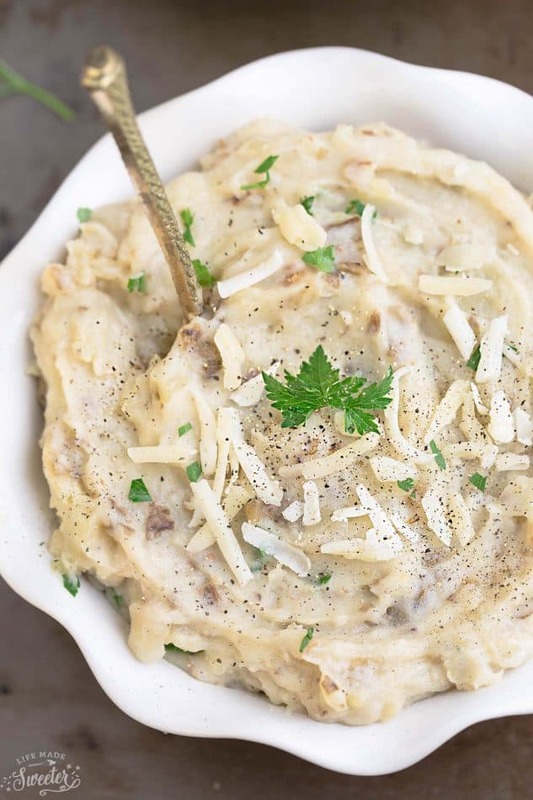 These Slow Cooker Mashed Potatoes with Roasted Garlic also show up a lot around here. 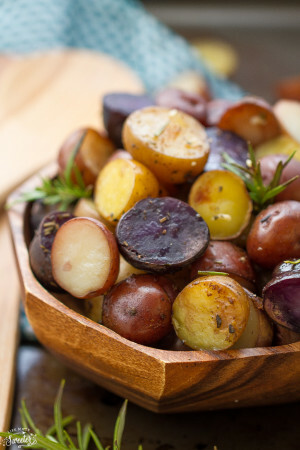 This is recipe is perfect for those days when you feel like peeling or boiling a gazillion potatoes. Start by washing and drying your potatoes. 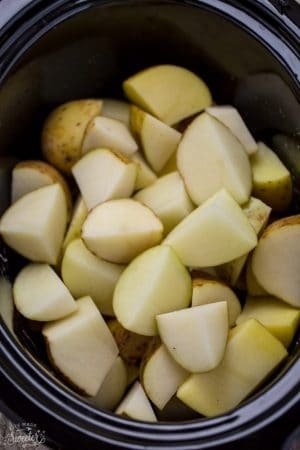 Then cut them into quarters – I used a mix of yellow and white potatoes. We love leaving the skin on mashed potatoes but you can totally peel them if you want first. 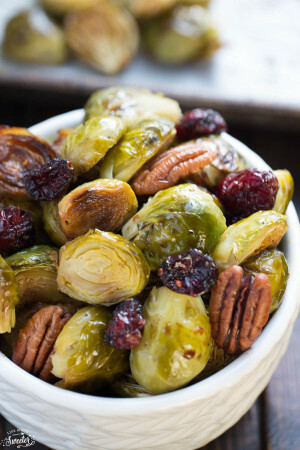 Toss them in the slow cooker for a few hours. While they cook, roast up a bulb of garlic. 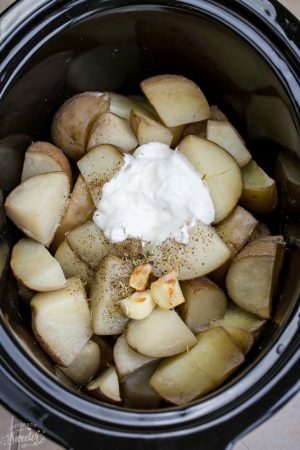 Once the potatoes are nice and soft, add the garlic, butter, Greek yogurt (or sour cream) and dried oregano. 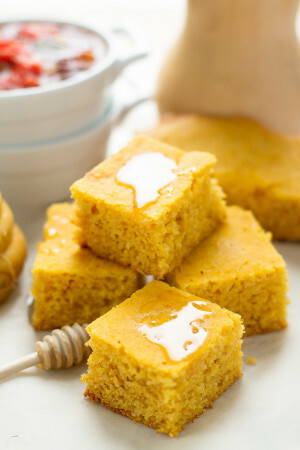 Then whip them up using a hand blender or mixer for just 20 seconds. Do NOT overmix if you’re using an electric mixer or the potatoes tend to get gummy and gluey. 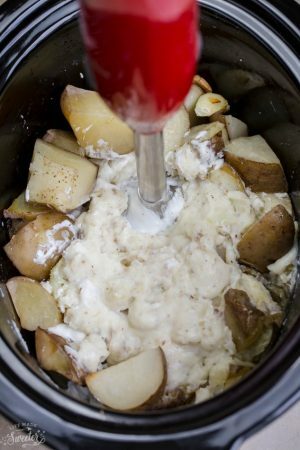 For best results, use a handheld masher to finish whipping the potatoes up until they are smooth and creamy. We like to leave ours with a few chunks but feel free to make them creamier if you like. Just a few ingredients and you can’t beat how ridiculously easy and creamy these are! 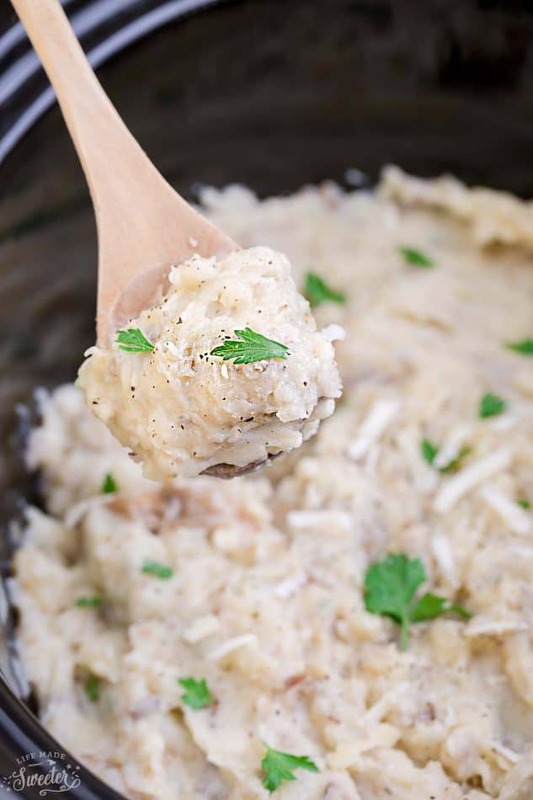 Slow Cooker Mashed Potatoes with Roasted Garlic are creamy, buttery and so easy to make right in the slow cooker! Place the chopped potatoes inside and add cover. Once potatoes are tender, add Greek yogurt, garlic, salt, dried oregano, Ranch seasoning (if using) and 1 tablespoon of milk. Mash with a potato masher until smooth and creamy. (Alternatively, you can use a handheld mixer to speed things up but only whip and fluff the potatoes for about 20 seconds - Do NOT overmix as electric mixers make potatoes gummy if you overmix). Then grab a hand held potato masher to mix in more salt, pepper and milk as needed. Serve warm with more butter, grated Parmesan and chopped parsley if desired.